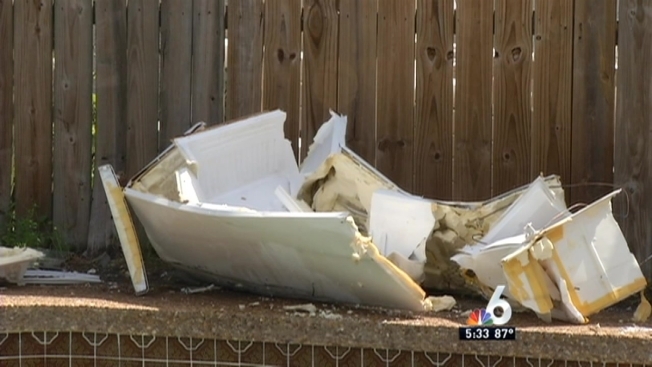 A Pompano Beach family had a very rude awakening early Tuesday, after the driver of a stolen car rammed through two fences and plowed the car into the family's pool and simply left the vehicle there. The bizarre accident happened around 3 a.m. Tuesday as the family was sleeping soundly inside. BSO said the stolen car crashed through the neighbor's chain link fence, then crashed through homeowner Gracie Medee's wooden fence, through her carport and ultimately, into her pool. Medee described the moment she awoke to the loud, unusual noise coming from her yard. "I was so scared. I said, what just happened," Medee said. "When I look in the window, I see a car in the pool." Medee said she immediately called her son and told him to call police. A driver of a stolen car plowed through two fences and landed in a Pompano Beach pool, then ditched the car. NBC 6's Keith Jones reports. Broward Sheriff's Office deputies confirmed the champagne-colored Toyota Camry was stolen, which likely explains why the driver took off running. It's unknown if the driver sustained any injuries in the watery crash. A tow truck could not even fit into Medee's yard, and instead used a long crane arm to lift the car from Medee's pool. No one at the house was injured, but they are shaken up. "Yesterday afternoon kids was playing in the pool, you know," said resident Belynda Baum. "We're always sitting right here, whatever time it is. So you never know." A search for the mystery driver is ongoing. Anyone with information is asked to contact Broward County Crime Stoppers at (954) 493-TIPS.